The First Family attended Sunday church services at Saint John's Church in Washington, D.C. this weekend. For the outing, Mrs. O wore a deep plum Alaia dress and jacket, paired with tall black boots. The dress was first seen during an Oprah special in 2009, here. The Obamas traveled back to the White House on Wednesday just hours following the election. Boarding Air Force One at Chicago O'Hare International Airport, Mrs. O revisited two style favorites: her famed Alaia belt and a wool and silk boucle coat from Duro Olowu. The Obamas attended a United Nations General Assembly reception at the Waldorf Astoria on Monday evening. For the event, Mrs. O rewore an Alaia frock, previously seen here and here, paired with a low heel for the occasion. 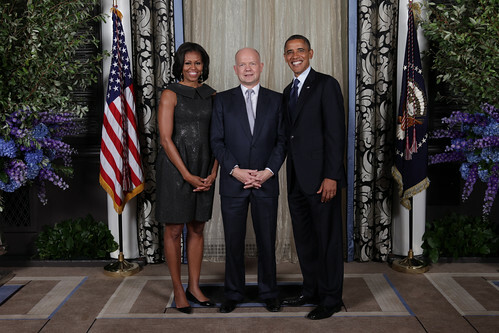 Pictured above, the president and first lady pose with UK Foreign Secretary William Hague. Something to ponder: I've noticed that the first lady is rewearing key pieces from her closet quite a bit lately, perhaps more than usual. Is it a style savvy approach to minimize media focus with the election upcoming? Or an effort to get mileage out of investment pieces? Maybe a little of both? It's been a sport-centric week for the First Lady thus far. Yesterday, Mrs. O addressed athletes from Team USA at a press conference held in Dallas, Texas. Today, she was back to the White House to host a Let's Move event honoring the LA Galaxy. On the style front, black and white appears to be the palette du jour. Mrs. O paired an oversized flower pin with a striped top, blazer and white trousers (not shown) in Dallas. For today's White House event, Mrs. O wore her signature Alaia belt in white with a Moschino bow blouse and black trousers. Update: Reader Elizabeth identifies Mrs. O's blazer as Moschino, available here.